as most of you know by now, this website is dedicated to my experiences that i garner through my time in the peace corps. what some of you probably don’t know is how the peace corps works or what the application process is like. i most recently listened to a terrific podcast on the matter, and though they cut out about half of what the volunteers go through in the application process, it does give an idea of how the program works and how it is changing. welcome! and thank you for joining me on this incredible journey that i am about to embark on. though, if you ask me, it’s already begun…back in december to be exact, when i finally received my assignment. for those of you not familiar, this process has taken much longer than anticipated. the average application process is between 12-18 months, which by the time i depart will have taken that much time. however, it was originally only going to be a 3-4 month turnaround, but there was hiccup with the usps and my medical work. somehow, though my documents were addressed to dc, they magically ended up spending about 3 weeks in indiana. needless to say it was an eventful few weeks, and the local post master got to know me more than s/he ever cared to. when all was said and done and my paperwork arrived, i pondered further about the commitment i was ready to embark on and having missed my slated departure timeline, i decided that i needed some additional time with my family before leaving, so i delayed for a spring departure….which now leads us to my june departure for peru! when i received the notification (thanksgiving week to be exact) that my invitation had been mailed, i spent the next two weeks anxiously awaiting the arrival of my postman daily. fyi, he arrives around 5:15pm everyday. but who’s keeping track, right? the evening it arrived, i received a voicemail from my dad stating the ups man dropped off a hefty little box from dc. i raced home…the moment that i have been waiting for finally arrived. a part of me didn’t want to open the envelope. i wasn’t sure if i was ready to start this next chapter in the journey. i quickly came to senses when i arrived home. 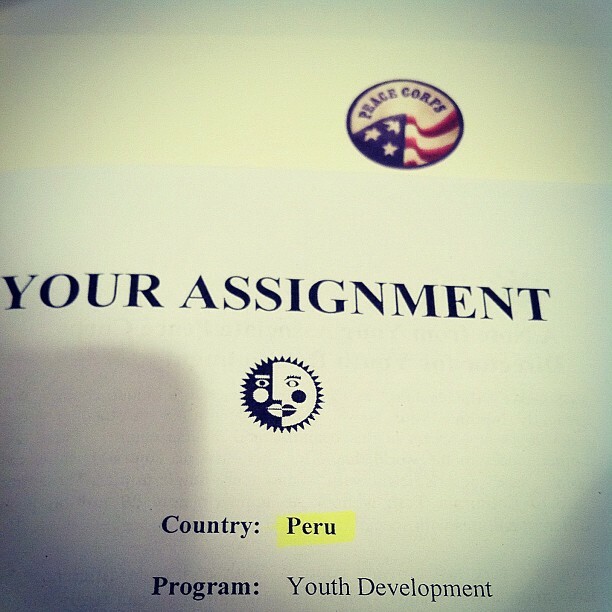 it must be noted that i had been crossing my fingers for the previous month or so for placement in peru. i was put in touch with a current volunteer there, who had been more than helpful during this entire application process and he had nothing but positive remarks about his country and the pc program therein. however, i also recognized that i could have been placed anywhere in the world, so i was relieved and ecstatic to learn that i would be heading to peru. and so it began. sending in my visa and peace corps passport information. surviving my yellow fever vaccination. creating my wish list (hint, hint) to help me budget prior to my departure. getting the deep clean by my dentist. and here i am, with just 57 days left before i go. but really. who’s keeping count, right?